Published by todd on January 10th, 2010 in Biographical. 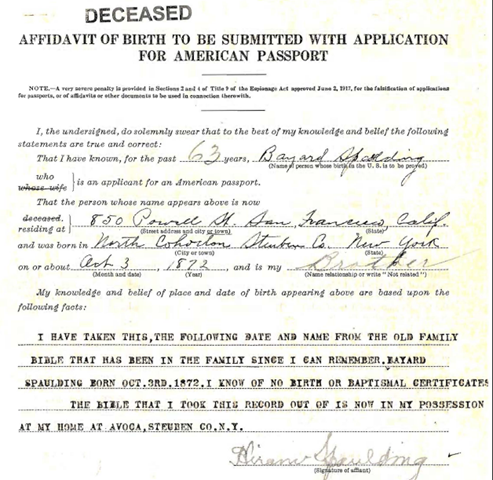 In part one of this series on Baird T Spalding’s biography, I examined new information that came to light as a result of the Department of State releasing Baird T Spalding’s 1935 passport application, which included an affidavit from his brother Hiram Spaulding, and confirmed much of the biographical research published here during 2009. The confirmation of Spalding’s name at birth (Bayard Spaulding), and his family details enables us to examine the apocryphal stories about Spalding’s father and grandfather having a long history with India. Dr Neva Dell Hunter is quoted in Life and Teaching Vol 6 on “Baird T. Spalding III…his father Baird Spalding II and his grandfather.. Baird Spalding the first” , noting that the grandfather had been born in India. Spalding’s biographer David Bruton also makes similar claims in Baird T Spalding As I Knew Him about “John Spalding, grandfather of Baird T Spalding”, who lived the greater part of his life in India. Baird T Spalding’s father was Stephen T Spaulding, a farmer in Cohocton, New York. Stephen Spaulding was born in 1840, the youngest of eleven children of Hiram Spaulding, an early settler in Atlanta. Stephen married Mary Hartwell in 1862 and raised his family on a seventy acre farm near the town of Cohocton, New York, where Baird was born in 1872. He grew hops and corn, and later potatoes. In 1891 the family moved to live on a farm on West Creek, near the town of Wheeler. Stephen Spaulding spent the winters in Florida where he operated a business shipping potato seed. He was known for the Spaulding Rose strain of potatoes, which remained popular until the 1930’s when it succumbed to a virus. Stephen Spaulding was mechanically inclined and filed a number of patents on farm equipment during his life. US patent # 98,202 issued in 1869 is an agricultural cultivator invented by Spaulding. Baird was noted as having a mechanical aptitude later in life, and his father may have been his inspiration. According to a genealogical article, Stephen Spaulding’s grandfather James Spaulding was born in England in 1772. There are no records showing a Baird Spalding I or II, or a John Spalding earlier in the family tree, and no record of a trip to India. An alternative way to verify the history of the Spaulding family in India is the India Office Family History Search database, which contains extensive records for Europeans in India between 1600 and 1949. Baird’s surname spelt as Spaulding only appears once in the entire India Office records, recording the marriage of an Alexander Spaulding in 1881. The Spalding variant spelling is more common as it is a popular English surname, but no variation of the name Baird Spalding appears. Two individuals named John Spalding appear in the database. The first, an infant born in 1780, would be too old to be Spalding’s grandfather. The second John Spalding was a British major in the 20th regiment of the Bengal Native Infantry, buried in 1826. Given that Stephen Spaulding was born in 1840, and that his genealogy can be firmly established via other sources, neither of these individuals are his father, or Baird Spalding’s grandfather. As a result, both the Neva Dell Hunter and Bruton stories above about Baird’s Indian connections can clearly be considered fictional. Like Baird’s alleged English heritage or 1857 date of birth, it’s likely that these were simply stories concocted to support Life and Teachings. Baird Spalding was the second youngest in a family of six children. Baird’s siblings included sisters Nettie, Hattie and Mary, and brothers Hiram and George. Unlike Baird, the rest of the Spaulding family remained in the New York area. Both Nettie and Hattie were members of the Women’s Christian Temperance Union, which organized in Cohocton in 1898. Hiram and George remained in Cohocton as farmers their entire lives. After the death of Stephen Spaulding in 1906, Baird’s mother moved from West Creek to Avoca with her son Hiram. She died on January 27th 1923, still active at the age of 89, and was buried in the Avoca Highland Cemetery. Baird’s older sister Mary Spaulding died at the young age of twenty, but the other Spaulding sisters went on to long lives like their mother. Baird’s oldest sister Nettie Spaulding married Charles Totten in 1890 and had three daughters Bessie, Mildred and Agnes. Nettie outlived all of her siblings, dying in 1958 at the age of 92. In addition to the passport application, several obituaries and genealogical databases corroborate this information. The oldest is an 1880 census record which lists the entire Spaulding family in Cohocton. This is the earliest official record of Baird Spalding. Spalding’s relationship with his family is an unknown quantity, but there are several hints that Spalding may have been estranged from them for some time. Baird spelt his fathers name incorrectly on his 1935 passport application, writing ‘Steven D Spaulding’, whereas the spelling on other documents is ‘Stephen T Spaulding’. Stephen Spaulding’s own 1906 obituary mentions the other Spaulding children but omits any mention of Baird. Finally, Mary Spaulding’s 1923 obituary notes her son ‘Bayard T’ as living in Alaska at the time, but Spalding had left Alaska at least a decade earlier. Isnt it true that Baird Spalding’s son wrote a book exposing his fathers work as fiction? Not true to my knowledge. Spalding had no children with his wife Stella. In 1934 Spalding was sued by Pauline Boyer in Oakland who claimed he was the father of her daughter. According to records of the case Pauline Boyer’s daughter would have been born around 1929. Boyer clearly knew Spalding, and she was involved in New Thought religious groups. She lost the paternity court case however, and nobody has ever identified themselves as Spalding’s daughter. I am continuing to research this however it has been difficult to find any further records of Ms Pauline Boyer in Oakland or Californoa. I did find one record indicating Boyer’s maiden name may have been Heesch and her family was possibly from Salt Lake City. According to the 1930 census from Los Angeles, her daughters name was possibly Jacqueline Boyer. I welcome anyone with info to contact me. The only other book about Spalding of note is Baird T Spalding As I Knew Him, by David Bruton, a fellow author and associate of Spalding in the 1950’s. I read these books in the 1980’s. Awesome! for the last 12 or more years I’ve been working with “The Urantia Book” if you liked spaldings work, you will love this. Why is it important to know if fact or fiction…….its words of wisdom that yes we all feel and already know inside what is and is…..Just sending out light and love for the reminder of what we know and feel. I much appreciate positive, soul traveling and spiritual journeys for world enlightenment. Let your light shine for all to see and feel. Thank you! Thank you! Hello, this is a very interesting blog. I will translate for you the introduction wrote by Jacques Weiss, (pen name: Louis Colombelle), an engineer who translated in French of “Life and technings…”. He was given the book in 1928. He translated it in 1932 and a few copies circulated informally. In 1947, “a voice from the invisible world informs me that if I leave right away for the US, I will meet Spalding et that if I didn’t go, the occasion would be missed for the rest of my life”. He then goes to the US, meets Spalding in NY, and receives his authorisation to translate the book into French, provided he answers letters that would be received in French. “One of the most common question was: Is this book a fiction or is it a narrative of a trip that really happened. Spalding would always give the same answer: ‘May every one take from my book what is good for him/her and believe what is appropriate according to his/her level of development'”. These are the main information I thought could be of interest to this blog. I hope my translation will be “readable” and I’m looking forward to reading your comments. One bio I’ve seen on Weiss says he was a French industrialist, an aviation expert, and former leader of the French underground resistance to the Nazi occupation. The article above says he was a president of two small coal and transportation companies in Paris. I am open to any additional info on Weiss readers are able to contribute. first, thanks for creating this blog, you seem to do a great research work. I took the time to read all info here and it’s clear that you make many efforts to find the truth behind this mysterious man. However, the work is not completed since many questions still do not have an answer… For the next part I will write in my own language. Selon vos recherches, il apparait de Bayard Spaulding à passé la plus grande partie de sa vie à mentir pour appuyer ses fabulations et il semble évident qu’il n’a jamais participé à aucune expédition avec de véritable maitres indiens… Il est effectivement probable que cet homme, comme tant d’autres, est simplement désiré s’enrichir avec le mouvement new-age. Par contre, si cette hypothèse est véridique plusieurs questions restent sans réponses. Baird T Spalding (Bayard Spaulding) est-il le véritable auteur de ces livres? Si oui, ou a-t’il trouvé son inspiration et ses connaissances? J’ai longuement étudié les mécanismes de l’esprit, la méditation et la mécanique quantique et il s’avère que malgré ses allures de fiction, ce live contient de véritables enseignements. Il faut plusieurs années d’études et/ou de pratique avant d’arriver à d’écrire le processus complet d’une séance de méditation avec autant de précision. Et la méditation est un exemple parmi tant d’autres puisque ce livre traite de plusieurs sujets qui nécessitent des connaissances approfondis. Je confirme que plusieurs chercheurs modernes peuvent trouver dans ses ouvrages des informations très pertinentes. De plus, de toute évidence, l’auteur du livre était très talentueux pour l’écriture. Ce qui est étrange c’est que Spaulding ne semble jamais avoir publié aucun autre ouvrage. Les auteurs new-thought les plus connus à cet époque ont tous écris plusieurs ouvrages. Spaulding semble être arrivé de nulle part. Du jour au lendemain, cet homme banal aurait accouché d’une merveille littéraire contenant des connaissances éclairées sur plusieurs sujets peu connu à cette époque. Vos recherche restent nébuleuses sur cette aspect du mystère. Il serait intéressant d’appondirent les recherches sur ses liens avec le mouvement new-thought. You said <> May I ask why you say <>… Where this infos came from and what was exactly this religious group? Si nous trouvons ou cet homme à puisé son inspiration, nous pourrions comprendre pourquoi un simple ingénieur de mine détenait autant de connaissances dans des domaines aussi variées tel que l’écriture, la spiritualité, la religion, l’astronomie, la biologie cellulaire, la physique quantique, etc. Un autre point me trouble, pourquoi le traducteur Jacques Weiss (Louis colombelle) à t-il écrit une préface qui semble plus ou moins confirmer les allégations du livre original. Il dit clairement avoir été guidé par des voix intérieure et il dit même avoir rencontré un des personnages du livre (Jast) en Inde… Si cet expédition était une fabulation de Spaulding, comment un autre homme aurait-il pu vivre une expérience similaire et rencontrer un supposé maitre indien? Jacques Weiss aurait-il inventé cette préface pour mousser les vente du livre en France. Pour vérifier cette hypothèse il faudrait prouver que tout comme Spaulding, Weiss n’a jamais mis les pieds en inde (1957) et qu’il n’a jamais rencontré les associés du Dalaï-lama. Si l’histoire de Weiss est véridique ceci pourrait plus ou moins confirmer les propos du livre. If this can help, Jacques Weiss spouse name is Simone Weiss. Like mentioned at http://www.decitre.fr/livres/Echos-de-Lumiere.aspx/9782716313933 she helped Brigitte Quéro for the writing of book ‘Echos de Lumière’. I will stop here for now but for me it’s clear, if your goal is to provide a complete bio of Baird T. Spalding, you need to focus more on his links with the new-though movement. This could explain where he took his teaching/inspiration. He said he learned from Indian master during his 1894 expedition. Your research proves it’s not true. Then now we need to know where exactly he took all the knowledge’s necessary to be able to write one of the most successful book of his time. “One of the most common question was: Is this book a fiction or is it a narrative of a trip that really happened”… All your infos prove Bayard Spaulding never did this 1894 expedition but this do not actually prove this expedition never happened to someone else’s. And same if this expedition and Indian master does not exist, this doesn’t prove that the teachings in the book are false. Personally, I would like to know why/how a gold miner suddenly became one of the most know new-thought writer. He stole the book to someone else? He was in a religious group and tried to spread his religion paradigm? He made this expedition in an other life? He was a medium channeling master? He learned religions, India map, meditation, biology, astronomy, spirituality, literature, etc. to create a spiritual related fiction and get money with human’s credulity and without knowing what he was doing, randomly explained many bases of the modern quantum physic? To confirm the hypothese of a simple charlatan, we need to know how many money he had at the end of his life. If he was rich this could confirm he was a charlatan. If he was poor, we could study all others hypotheses because this guy, by many way, could have been really rich. You said “According to records of the case Pauline Boyer’s daughter would have been born around 1929. Boyer clearly knew Spalding, and she was involved in New Thought religious groups.” May I ask why you say she was involved in New Thought religious groups? Where this infos came from and what was exactly this religious group? Thanks for your thoughtful comments. Unfortunately I have recently undertaken a new work venture and haven’t had as much time to research Spalding as I would have liked. It’s a little known fact that before Spalding published Life and Teachings as a book in 1924, it was published in periodical form in 1922 by a San Francisco based New Thought group called Comforter League of Light. My source on this is Melton’s Encyclopedia of American Religions. You can read the details of the League at http://www.novelguide.com/a/discover/ear_01/ear_01_00131.html (search for Comforter). I managed to find a single copy of the Comforter magazine from 1922 and sure enough, there is a chapter of Life and Teachings in there, and it refers to Spalding as a member of the group. I have also researched the founder of the group Florence Gloria Crawford who wrote several books. Unfortunately I have been unable to locate any other copies of The Comforter from those years, which would be very interesting in terms of comparing how the manuscript changed over time. If anyone does find such a copy, please contact me. I’ll have to go back and search my notes on Pauline Boyer, but the alleged affair and paternity lawsuit was reported in the Oakland Tribune at length in 1935 so that is my main source. The same article claims Spalding admitted that Boyer was a friend of Stella Spalding. I have been unable to get the court documents for Boyer’s 1935 paternity lawsuit or Stella Spalding’s divorce from Baird the year after, which I’m sure would help to clarify some matters. We do know the state of Spalding’s affairs at the end of his life in 1953. If you find an original 1954 copy of David Bruton’s biography on Spalding (Baird T. Spalding As I Knew Him) there is an entire chapter of the disposition of Spalding’s estate and the many claims of his wealth. It’s very clear that Spalding was penniless when he died, that royalties from DeVorss for his books were his main source of income and the rights to his books were the only items in the estate (which were fought over by Bruton and DeVorss). Note that this entire chapter on Spalding’s estate has been edited out of all later editions of the biography released by DeVorss. When I met with Bob Cowles earlier this year, he related a tall tale from Spalding about his gold mines from only a year or two before Spalding died. Going back to the very first records I can find, there is an obscure biography which mentions Spalding’s time in the Yukon in the 1890’s and also contains a couple of early Spalding tales which haven’t checked out. I have unpublished correspondence from family members in 1911 which clearly indicates that Spalding suffered from delusions for decades, and records show he was confined to an asylum in California briefly in the 1940’s. Certainly this would explain the many inconsistencies in Spalding’s life story, and is not an uncommon occurrence in new religious movements. The question remains – where did Spalding get the inspiration and material for the first two books? I know he was connected with Guy Ballard of the I AM movement, and Stella typed manuscripts for Col Jack Churchward of Atlantis fame who was a personal friend. Stella Spalding was a university educated woman with an obvious literary talent. Baird was surrounded by people working in this genre. But none of this explains how and why a somewhat uneducated miner wrote Life and Teachings and why the books became what they are. My research continues. A friend loaned me these 6 volumes after telling me one of the stories in them. These very dated and naive books are so obviously fiction and so blatantly unscientific that I can’t believe anyone with access to a library would even ask the question. It wouldn’t surprise me in the least to discover that they’re the inspiration for Carlos Castaneda’s fictional works. Baird Spalding was apparently a devout spiritualist Christian, who used the exotic and then unknown context of the “mysterious” Far East to attract a readership. But these books are All about Jesus and God the Father. He is proven to have lied about his age and identity and he offered no proof whatsoever of anything he said. He doesn’t quote or refer to any actual Buddhist, Taoist or Confucian writings or prominent figures that are known today. He said on the first page: “Enlightenment IS Christ”. So we’re not talking about Buddhism or Eastern wisdom. Spalding was a Christian, trying to pretend that Buddhism, a major religion/philosophy that is adhered to by millions of people is actually some kind of miraculous version of Christianity. He wrote in the days when writers could get away with fabricating their “adventures”. Publishers and readers were less skeptical and discerning. Whether you like his new-age ideas about Christianity or not is of no account in scholarship. Read and enjoy, but keep the man in the Fiction section. There are today vast resources for you if you are interested in metaphysics, like Spalding was. If you want to read something authentic about Far Eastern teachings there are thousands of standard classics like the Tao te Ching or the Dhammapada. Or for authentic personal accounts you could try The Three Pillars of Zen, by Philip Kapleau, who studied in Japan mid-century and founded the Rochester Zen Center. Or any of the excellent scholarly books by D.T. Suzuki. Or any version of the Jataka Tales that tell lovely imaginary stories about the various incarnations of Buddha into animal forms, for the purpose of teaching lovingkindness. Google Buddhist literature. Get the idea? There are many authentic Buddhist records and teachings and they are much older than Christianity. Buddha himself was born around 500BC and his and his followers’ teachings are extensively catalogued and widely available. I am reading these books for the first time, having never heard of Mr Spalding before. I keep an open mind but am also mindful of the stories of many strange, weird and wonderful phenomena that occur in places like India…..and indeed others around the world. His books are not the only ones in which I have read about ascended Masters. I was reading about them as a young person in the 1980’s. I think many people fear the very idea that such Masters might exist. The fear that people might actually be able to disappear at will, or achieve near-instant travel, or produce food from thin air…… to our 3D minds, such feats are incomprehensible and therefore, if we cannot understand them, they are deemed impossible. And indeed if Mr Spalding’s writings were fiction, that suggests that everyone else who ever wrote a book or article about such ascended Masters might also be suspect. They can’t all be wrong. However, I do not consider all this too important. To me, his teachings are a great treasure and I can see that he has been a forerunner that planted a seed for so many people all over the world who received it in their hearths to create a better world beginning with ourselves. Good find Enita. I had never noticed that Spalding stated that before in Vol V. Of course, stating he was born in India was just part of Spalding’s story, which he changed over the years to suit his audience. Thanks for your comment Chris. Most of the ‘ascended master’ teachings in the current New Age schools date from the ideas of the Theosophists in the late 1800’s. His links with “The Comforter League of Light” answer few questions about his inspiration. It would be, effectively, interesting to find a copie of The Comforter. The only info I found about this magazine is the year of the article publication: 1922. Would it be possible that Churchward asked Stella to write/translate “The life and teaching of master” and Baird decided to spread the story via his new-though movement (magazines)… ? This is an evasive scenario but actually seem to be possible… Specially if we could prove that Churchward (contrariwise to Spaulding) really traveled in India/Tibet around those years. 1. Response in the Living and Nonliving, Longmans, Green & Co., London, 1902. 2. Plant Response as a Means of Physiological Investigations, Longmans, Green & Co. London, 1906. 3. Comparative Electro-Physiology, Longmans, Green & Co. London 1907. 5. Collected Physical Papers, Longmans, Green & Co. London 1920. 6. Plant Autographs and Their Revelations. The Macmillan Company, New York, 1927. 9. Letters to Rabindranath Tagore (in Bengali Patrabali), (edited & annotated by D.Sen). The Bose Institute, Calcutta, 1994. Would it be possible that Churchward asked Stella (Spaulding wife) to write/translate “The life and teaching of master” and Baird decided to spread the story via his new-though movement (magazines)… ? This is an evasive scenario but actually seem to be possible… Specially if we could prove that Churchward (contrariwise to Spaulding) really traveled in India around those years. Thanks for the info Simon – much appreciated. I do have one copy of the Comforter, and it has a section of Life and Teachings excerpted in it, as well as other New Thought writings. I’ve been unable to find any other copies though, despite searching high and low. I’ve also got one book by Florence Crawford but it’s a generic mix of Christianity and New Thought material. Crawford seems to have had a spiritual awakening after a mid-life crisis and moved to San Francisco to start Comforter League of Light. If you search her name in newspaper archives around that time (e.g. Oakland Tribune in the 20s and 30s), she spoke at a number of religious and pacifist rallies. She died in 1948 but did have a son (Timothy Crawford, born 1904 in San Francisco, died 1978) and I wonder if any diaries or correspondence survive. I’m sure she would have known Spalding well and may have written about him. Master Mind magazine was published by DeVorss and they covered all of their authors including Spalding so I wouldn’t be surprised to find other parallels there. Annie Rix Militz who you mentioned above, was the editor of Master Mind and also a friend of Crawfords and wrote at least one editorial about her in 1915 in the magazine. Another interesting angle is the local real estate magnate Frank C Havens and his wife Lila Havens. They were wealthy Theosophists who built Wildwood Gardens aka the Havens Estate in Alameda. It appears at one time they were patrons of Spalding, but I’ve only found a couple of newspaper articles. Lila Havens is likely the ‘very prominent woman in Oakland, California, whose husband was the builder of the Oakland Municipal Railway’ that paid for Vol 1 to be published, as referred to in some of the stories about Spalding. Todd, thanks again for all provided info’s. However, at my opinion, the most interesting angle to follow is their direct link with James Churchward. James Churchward (February 27, 1851-January 4, 1936), is an Anglo-American who spent a great deal of his life in India and author of a series of books, beginning with Lost Continent of Mu, the Motherland of Man (1926), re-edited later as The Lost Continent Mu (1931). Other popular books in the series are The Children of Mu (1931), and The Sacred Symbols of Mu (1933). Churchward published The Lost Continent of Mu in 1926. Like you know, life and Teaching of the Masters of the Far East which told of a research expedition to India and Tibet in the 1890′s have been published in 1922-1924. You have clearly demonstrated that Spaulding couldn’t have done those expeditions in the 1890′s. However, before coming to the US in the 1890s, Churchward was in Sri Lanka (near India/Tibet). And according to the article “James Churchward – Lost Continent or Lost Cause?” by Churchward’s god-daughter Joan Tate Griffith , while Churchward toured India for the last time -presumably between writing his first and second books- he visited the same temples and monasteries where he had spent years in his early manhood, in discourse with Rishi and studying tablets and scrolls in Pali, Sanskit, Tibetan, Chaldean, and Uighur. Also, Spalding’s books and his publisher say “Baird T Spalding” was born in the 1850′s in England but we know Bayard Spaulding is born in 1872 in Cohocton, New York. However, James Churchward is born to Henry and Matilda Churchward at Stonehouse, Bridestowe, Okehampton, Devonshire, England. Official date of born: 1851. Contrariwise of Bayard Spaulding, it clear that James Churchward has a true traveler background and has done a lot of expeditions during his life. A search with keywords “James Churchward, India”, “James Churchward, Gobi”, “James Churchward, Alaska”, “James Churchward, Mexico”, etc. reveal a lot of references, articles and links. Also, “Teaching of the Masters” and “Lost Continent of Mu, the Motherland of Man” contains a lot of similar references about the lost continent of Atlantide, tablets, Gobi desert and Naacal… If you read again attentively “Teaching of the Masters” you will also notice a lot of references about Mexico and past expeditions from the author. All these coincidences and facts tend to point out that maybe James Churchward was directly involved in the writing of the book “Teaching of the Masters”. However, same if it would be the case, this do not answer the most common question “Are the books fiction or non-fiction?”, after its first publication in 1926, Churchward’s book attracted a lot of ridicule and criticism from the archaeological scholars of his day, and very few of them took his findings and theories seriously. It was regarded more as wild fiction than a serious scientific study. But today many such monumental works as Churchward’s are being taken considerably more seriously, as outmoded old dogmas are being overturned by the new findings of more enlightened scientific researchers. Also, all his patents , inventions and travels give him some credibility if we compare with Spaulding and DeVorss dubious reputation and nebulous history. James Churchward is best known as a British born writer. However, he was also a patented inventor and engineer . Churchward gave a vivid description of Mu as the home of an advanced civilization, the Naacal, which flourished between 50,000 and 12,000 years ago, was dominated by a “white race,”: p. 48 and was “superior in many respects to our own” : p. 17 At the time of its demise, about 12,000 years ago, Mu had 64,000,000 inhabitants and many large cities, and colonies in the other continents. 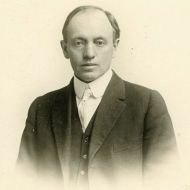 He was the elder brother of the Masonic author Albert Churchward (1852–1925.) He was a tea planter in Sri Lanka* before coming to the US in the 1890s. In James’ biography entitled My Friend Churchey and His Sunken Continent, he discussed Mu with Augustus LePlongeon and his wife in the 1890s. He patented NCV Steel, armor plating to protect ships during World War I, and other steel alloys. After a patent-infringement settlement in 1914, James retired to his 7+ acre estate on Lake Wononskopomuc in Lakeville, Connecticut, to answer the questions from his Pacific travels. In 1926, at the age of 75, he published The Lost Continent of Mu: Motherland of Man, which he claimed proved the existence of a lost continent, called Mu, in the Pacific Ocean. *Sri Lanka country off the southern coast of the Indian subcontinent. Sri Lanka is an island surrounded by the Indian Ocean, the Gulf of Mannar and the Palk Strait, and lies in the vicinity of India and the Maldives. It is part of South Asia. Sri Lanka has also been a center of the Buddhist religion and culture from ancient times and is one of the few remaining abodes of Buddhism in South Asia. 1. Churchward, James (1926). The Lost Continent of Mu: Motherland of Man. 2. Churchward, James (1931). The Lost Continent of Mu. Ives Washburn. pp. 335 pages. Thanks Simon. The Churchward connection is definitely very interesting. As I mentioned, Jack Churchward (Churchward’s great-grandson) and I have corresponded and I have a copy of a letter Churchward exchanged with Stella when she was typing his manuscripts. Jack’s excellent site is at http://www.my-mu.com and has a lot of info on James Churchward. I’ve researched that photograph and identified a couple of people in it – it’s the departure of Spalding’s first actual trip to India in Oct 1935, on the SS President Hoover. Not sure if I believe that is Churchward. It’s possible given that he was in Los Angeles when he died three months later. He definitely didn’t travel on that trip though. Here’s another interesting connection. Guy Ballard, leader of the I AM religious cult and writer of the Saint Germain / Ascended Master book Unveiled Mysteries, was allegedly a friend of Spalding, and they spent some time together in the 1920s. Ballard grew his books into a full-fledged cult which survives today. Yes Todd, It’s when you’ve enlightened the link between Stella and James that I had the intuition that James could had been also behind the book. I had the feeling that a big part of the mystery wasn’t covered. It’s why I’ve made further investigation. [Are the books fiction or non-fiction? Did Spalding actually go to India in 1894? I don’t say all the content in the book is not a fiction BUT when we study James past, we are in the obligation to agree it’s really strange that Spalding’s books and his publisher say the author was born in the 1850′s in England and traveled in India. James was 43 in 1894, is born in the 1850s (England) and traveled in India many time during his life. He also had many knowledges in world exploration and had close links with many archaeologists. It’s not complicated, if we consider that maybe Baird Thomas Spalding is the nom de plume of James Churchward, we easily start to find a lot of parallels and interesting coincidences. And suddenly we start to see the shape of the puzzle. About the picture of departure of Bayard’s first trip to India in Oct 1935, I was initially 90% sure James is standing between Douglas DeVorss and Spaulding. But to be 100% sure, I verified the face proportions compared with others picture I have of James. If we examine carefully the shape and characteristic of his face, we can conclude at 99% it’s the same guy on both pics. Space between eyes, ears, nose and jaws are exactly the same. Also, the cravats/tie of all other man on the pic are dark tone. 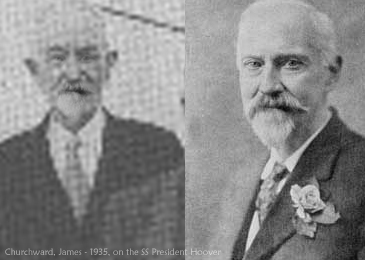 James, on all photos I found, always wear pale tie… Except if he had a brother, Churchward stand on this pic. And yes, I’ve read many stuffs from his great-grandson, Jack, and god-daughter Joan Tate Griffith. Seem they are still in life and actively interested about the past/expeditions of James. About the copy you found of the letter Churchward exchanged with Stella when she was typing his manuscripts, I’d like to ask when you will have free time, if you could post here or via email the transcription. I would also like to see the chapter you found in the Comforter. I searched both online and couldn’t find anything. For my part, I will try to continue research if I have free time.. Like you, I think this an interesting mystery… and like us, a lot of person seem to wonder what is the exact truth behind the book. In fictional books, there are always elements of veracity, or coincidences, even for unknown locations, that maintain some doubt in the mind of readers. (Provided that the very author was informed somewhere…). Two examples: 1) Tablets 2) Potal and Asmah. 14 x 24 inches and about two inches thick and weighted from ten to twelve pounds each. Others were much larger…” see page 23 – Vol. 2 [Chapter II]. From data given about the woodblock tablets of Tripitaka Koreana (more than 80000), where some original engraved tablets were stored since 1098 in the buddhist temple of Haeinsa (South Korea), we can take a look at the format of some of them containing miscellaneous sacred scriptures. Range of dimensions: between 7×14 inches and 24×38 inches, thickness 1.5 inches, weight around 8 pounds. Each woodblock is lacquered on both sides. As said, the diversity of sizes depended on different kinds of tablets used through centuries. Many printing and diffusions were disseminated widely in the Far East (and could have been seen by some world travelers). If we leave aside that these tablets are written in Chinese characters, the fact remains that they were mainly translated from Tibetan or Indian languages. Note also that the amazing process of their conservation and the format, particularly adapted, could have been discovered by other civilizations many thousands of years ago. For a long time we wondered if the place names such as Potal and Asmah (with exactly the same spelling as that used by Spalding) had actually existed somewhere in the world, even if it was not in India’s northwest (West Pakistan), as one might suspect. Surprisingly we have found an answer, but in East Pakistan ! Ref. : Life and Teaching of the Masters of the Far East, Volume 1 Copyright © 1924, 1937 by Baird T. Spalding, Revised Edition Copyright renewed, 1964, see p. 15, Chapter II, and p. 19, Chapter III. POTAL.-A town in the British district of Mymunsing, lieut.-gov. of Bengal, 44 miles S.W. by west of Nusserabad (Nasirabad ?). Lat. 24° 21’, long. 89° 50’. ASMAH, in the British district of Mymunsing, lieut.-gov. of Bengal, a town 52 miles E. from Jumalpoor, 61 miles W. of Silhet. Lat. 24° 53’, long. 90° 53’. About seventy miles distant (this remains approximate, taken into account the approximations done about Long./Lat. themselves) . These two places (clearly not villages however) were located at the present site of East Pakistan (Bangladesh) and their names have been certainly known to J. Churchward who traveled extensively in India. Our reflections are just a few ideas, not evidence. Le 28 janvier 2012. Recently, I got the good idea of searching an early edition of the French translation of “Life of the Masters″, which Simon has already talked about on this current website and blog devoted to Baird T. Spalding. Indeed up today, the only edition in my possession dated 1972, published by Robert Laffont. I found an original of the third edition published by Editions Leymaries, Paris V, 1946; the translator is Louis Colombelle, AKA Jacques Weiss. Let me tell you about an unexpected discovery that goes in line with the findings of Todd, as well as other contributors, related to a highly probable collaboration Spaulding-Churchward. Who was aware that there was a map in this French edition of “The Life of the Masters”, just in back of the introduction page? Moreover, as can be seen, this latter contains the well known erroneous data about Spalding’s life. Take note that no other illustration is included in the book. Obviously, this is the map from Churchward, showing, among other things, his lost paradise of Mu. One would wonder why this map is placed inside this book, spiritually oriented, while its topics are rather unrelated with the map. The copyright is also interesting and appears as follows: ‘© by BAIRD T. SPALDING and LOUIS COLOMBELLE, Paris 1946’. This is more or less an ambiguous contradiction to allegations given by J. Weiss himself, on a later reissue of his French translation (26 years later). From the translator’s preface to the eighth edition (Laffont’s editions), one can understand that J. Weiss translated ‘LIFE of the MASTERS’ in 1937. This book, in the original English edition, had been offered to him by Paul Dupuy in 1928, then editor of the Journal “Le Petit Parisien”. [We verified that P. Dupuy died in 1927!]. After unsuccessful attempts to contact Spalding, Weiss claimed that he published a first edition of his translation (by Leymaries), without Spalding’s permission . . . In 1947, a year later, Weiss said that- thanks to an invisible voice- he had traveled to New York where he was finally able to meet with Spalding ! Also note that any map of “Lost continents” appeared in Editions Laffont (since 1972)! I find that all these facts contain far too many coincidences or erroneous information. Do you ? P.S. : I would appreciate if Simon can contact me directly, and “dans sa langue maternelle”, this would be welcomed. Ich finde all diese Recherchen interessant, dennoch glaube ich, daß es eines großen wachen Geistes bedarf im spirituellen Sinne, um all solche Botschaften zu empfangen, oder zu gestalten. Ich wandelte selbst auf den Spuren eines großen Meisters “Babaji”, der zur Meisterlinie Paramanansa Yoganandas gehört im Himalaya. Ich erlebte Situationen, die ich nur mit Spalding-Schilderungen vergleichen kann. Auch ich war mit einer Gruppe auf Reisen, weil Babaji mich dazu aufgefordert hatte in der Meditation und folgte dem Ruf. Ein Teil der Gruppe begriff mehr -ein Teil weniger und ein Teil sah es nur als Strapaze an diese Reise. Ein offener Geist kann viel erleben, was für andere nicht erfahrbar ist. Ich empfehle” Die Autobiographie eines Yogi” zu lesen von Paramahansa Yogananda.. Dort findet man genau solche Beschreibungen des Erscheinens aus dem Licht sich formender Wesen, wie Spalding sie beschreibt. Vielleicht hilft es unterstützend Spaldings rfahrungen nicht als Spinnerei abzutun! Vous pouvez me contacter à l’adresse sb(@)niveda.ca . Thanks B+ – this is very interesting info. As we are still not able to see all, that surrounds us, it is pretty difficult to explain the unseen to people, that wear different glasses. A good example is depicted in the movie: Life of PI. At the end, the storyteller leaves us the choice, whether to believe the true story or something that could as well has happened. For me, as a traveller towards my true self, a few weeks ago, I have been lead to this book and when I received it from my protective lady, I cried bitter tears. As I started reading it, even then I couldn’t stop letting my tears go. It felt, as if I found parts of my true family. I never knew about Baird Spalding till then and the information I would receive and read. Until now I can only state, that what I have read reflects to what feels right. Especially my own developments of the past 3 to 4 years, reflects to what is written. One of the most important indication regarding immaculate conception of Mr. Spalding is explained in what Jezus explained: when you are open and receptive you can find and speak with me anywhere. And I believe, that is just what has happened. The most difficult part for a receiver of messages is to pass it over to others in a way, that it is also easily understood, because messages mostly come at unexpected moments and in such a quick way, that you need to have time for yourself, to reorganize. It is often overwhelming for the receiver himself. And beside that, at the same time, you need to continue you’re normal way of life and the impressions that relate to that. My advise, read it, use what you can accept and build on………somewhere God is awaiting on us all and yes someday, we all will reach that state of the art. Sorry, a missing info to my last post, October, 3.
for my movies ‘TEMPLE EN TAU’ & ‘TEMPLE TAU-SHAPED’. Hello, My name is Aberamantho from South Korea. I read your great information thanksfully, B+, simmon and all. I am representing the group of people who practice Yoga and spirituality in South korea Wonju. Actually we were searching for temple of healing since 1998. We went India directly but we couldn’t find the place. We are really in thirst for long times. I read B+, simon and others. I hope you to share information which you made up recently, please. I was in India for 5years. My family is ready to go India back to find the place. We will share all the experience if we got reach there. So Again I humbly request you to share recent information. You are last hope for us. Thank you for your attention. As I understood the owner of my-my.com is a nephew of James Churchward. Maybe hi has some additional info about connection between Churchward and Spalding. Today, April first 2019 I discovered your site on Spalding Thanks for your work. I am french speaking so I will continue in french since you have a translator. Je médite sur l’enseignement des maitres depuis 50 ans. Après 16 ans d’aprivoisement j’ai suffisamment apprécier l’enseignement pour décider de centrer ma vie sur la pratique. J’ai quitté le système traditionnel vécu au désert de Chiwawa au Sud du Texas pendant 15 ans avec ma cojointe et je n’ai jamais regretté d’avoir tout lâché il y a maintenant 34 ans. Je ne cherche qu”à expliquer que ma douce et moi-même prenons l’enseignement au sérieux. Or ce que fut Spalding me semble intéressant mais l’enseignement est inestimable. Il vaut la peine de jouer le jeu et ce jeu est tout-à-fait intéressant à vivre.J’ai le livre publié chez Laffont et traduit par Colombelle et je suis étonné de voir à quel point ce traducteur a réussi son travail. Colombelle a aussi traduit : J’ai vécu sur deux planètes. Aujourd’hui 124 ans après les évènements, nous voyons déjà que plusieurs prédictions des maitres se sont réalisées. J’ai souvent le gout de commenter cet enseignement auprès de gens qui le connaissent et le mettent en pratique de leur mieux. Un échange de nos compréhensions me semble souhaitable. Si votre site m’en donne l’occasion peut-être que des commentaires sur l’enseignemet lui-même deviendrait intéressant pour tous. Amitiés à tous.